The time had come. 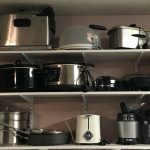 Our kitchen cabinets were set up for one flow, but lately we have been using them differently. Time to reorganize! So a young friend and I set to work one morning. Below are the practical principles we used as we evaluated and restocked. Put things where you use them. Dishes usually make sense near the sink and/or dishwasher and table. Pots and pans will be used by the stove, so don’t walk across the kitchen if you don’t need to. If you have a stand mixer and always bake on one counter, go ahead and stock those supplies near there. Although you may get extra steps toward your daily goal criss-crossing the kitchen multiple times, it may not be the most effective or efficient way to accomplish that goal AND make dinner. One step at a time. We followed the same process we have discussed when refreshing closets. Everything came out. Clean the cabinet. Sort. Decide where it will be best located and arranged. Put it back, one cabinet at a time. 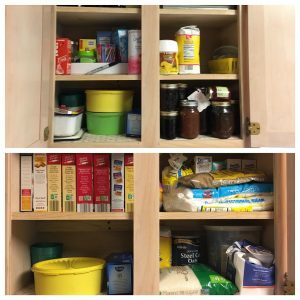 Although we could not empty the entire kitchen at once, due to limited counter space, we did empty the entire cabinet we were working with each time. Match up sets. Pots have lids. Pans have lids. Casserole dishes have lids. You will probably come up with some mismatched lids, where the dish broke but the lid didn’t go in the trash with it. 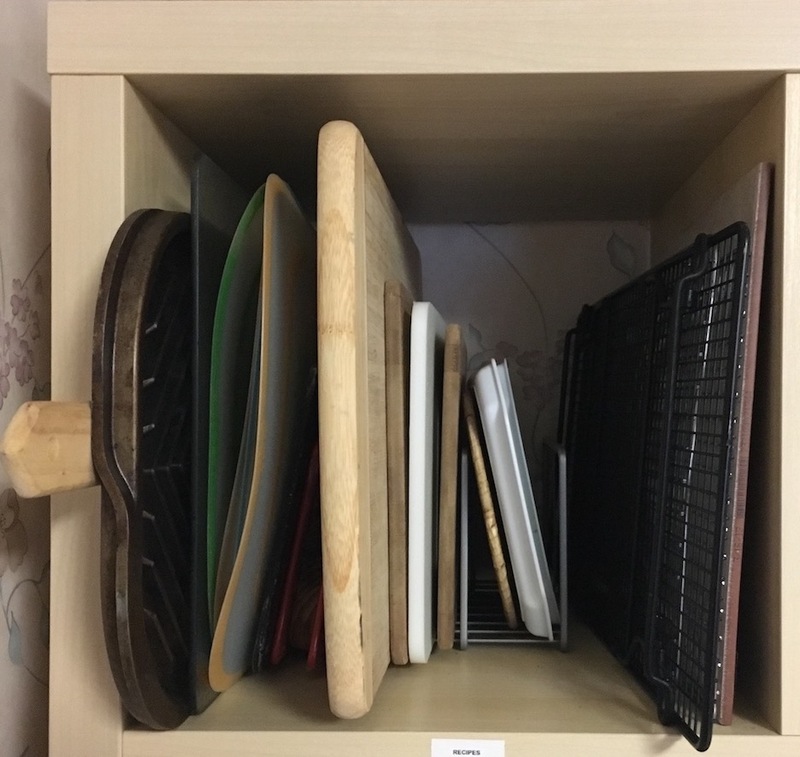 You don’t have to keep the lids with the items as you place them back in the cabinet, but it will help you not keep lids you don’t need. Cups need to go together with like cups. When all the cups are in one place, you may notice that you have more than you need. For instance, I ended up with 3 of the same size saucepan. Since I don’t often–make that never–use all 3 at the same time, one would be a good to donate to someone who doesn’t even have one. Make the most of your space. Some cabinets have extra tall room. Some are more narrow. Use those to your advantage. Stack bigger things in the tall cabinets, or use stacking shelves inside the cabinet to stack smaller things taller. Keep in mind, however, that your kitchen cabinets are usually well-used. Don’t stack or cram too much in any space. It needs to be easy to reach in and grab whatever is needed each time. Having your child start a cup landslide isn’t the quickest or best way to a glass of water. Also, remember that flat things can go sideways to allow you to grab one in the middle without having to re-stack and potentially make the most of room up. Keep like items together. As you replace items back in the cabinet, take a few minutes to put all the same things together. All the sugar in one row. All the red glasses in one row, then the yellow glasses, then the plastic school memento cups. All the bowls in one section of the shelf. 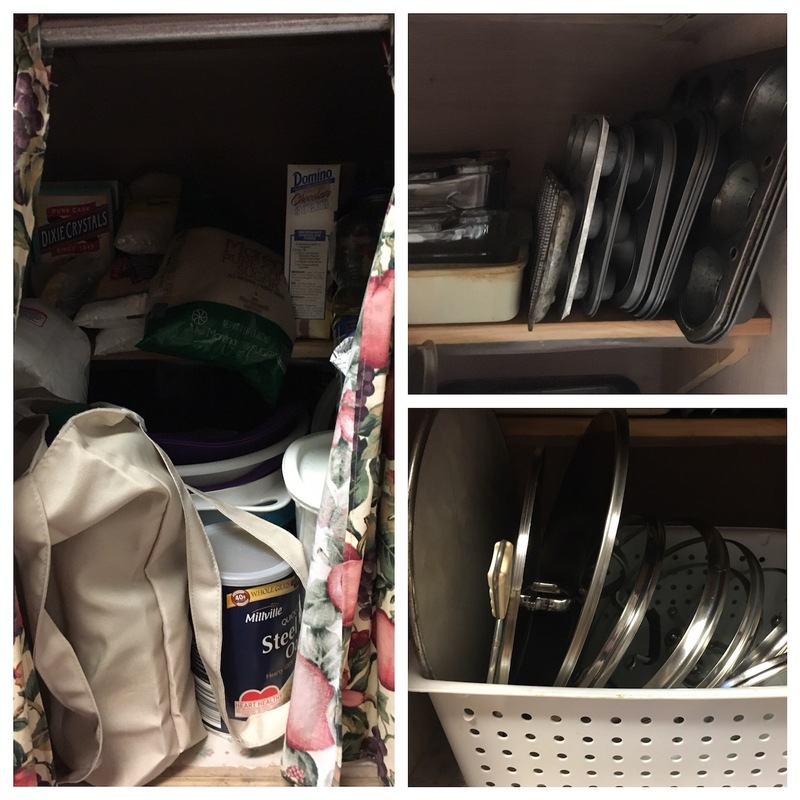 This helps you see at a glance what you need as soon as you open the cabinet door, rather than having to search through a broad category of cups or dishes. It is also easier to unload the dishwasher when the time comes. You already have a place for everything. High shelves are for rare items. The very top shelves, or the very back of the corner cabinet, are for the items you only use once or twice a year. Don’t strain yourself unnecessarily. You will be able to get them when you need them, but that leaves room for the often-used items on the easy-to-reach shelves. Label enclosed containers, so you don’t have to wonder what is in the canisters. Contain loose or sloppy (shapeless) items. Decorate what you cannot fit in the cabinet, or needs to be even more accessible. Baskets, canisters or hanging bins on the countertop, if used in moderation, can be attractive and useful. 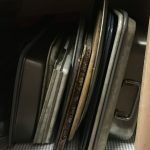 So if you have the need to reorganize your kitchen at any point, keep these things in mind. I hope they are immensely helpful to you! If you have anything to add for the good of all, please comment below to expand this resource.